Some of the long distance bus services did function while local services did not. 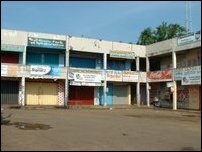 Candidates from far away places could not appear in time for the GCE (OL) examinations held in Vavuniya town schools as there were no buses to transport them. Meanwhile, Chettikulam police in Vavuniya district claimed that a Liberation Tigers of Tamil Eelam (LTTE) cadre was shot dead in a clash at Ulukulam area in Vavuniya Wednesday night between Home guards and the LTTE. The man shot dead in the clash has not been identified. In a separate incident Wednesday evening, policemen shot and seriously injured a youth at Varikuttiyoor in Vavuniya, the police in Vavuniya said. The seriously injured youth is identified as Selvarasa Chandrasegaram 25, a new recruit of a demining organisation. He is being treated at Vavuniya hospital.